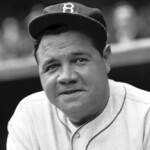 George Herman Ruth Jr., better known as Babe Ruth was born in Baltimore, Maryland, USA. He was an American professional baseball player whose career in Major League Baseball spanned 22 seasons, from 1914 through 1935. He began his MLB career as a stellar left-handed pitcher for the Boston Red Sox, but achieved his greatest fame as a slugging outfielder for the New York Yankees. He is regarded as one of the greatest sports heroes in American culture and is considered by many to be the greatest baseball player of all time. He was one of the first five inductees into the National Baseball Hall of Fame in 1936.